A uniquely designed, secured residential community specializing in Alzheimers and dementia care. 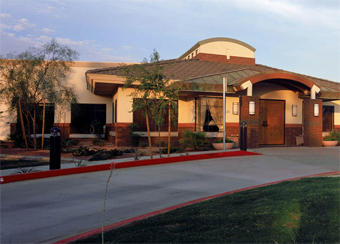 Located in the Ahwatukee Foothills neighborhood of Phoneix, our award-winning acommunity features 47 spacious private and shared residential suites and distinctive common spaces dedicated to promoting life enrichment activities and programs. At Hawthorn Court, our comprehensive health and therapeutic services help to support both our residents and their loved ones. Our proprietary In Touch® Dementia Care Program offers quality sustaining care for those with Alzheimer’s or related conditions. And, we’re directly adjacent to Thomas Davis Medical Center. Rustic, ranch-style architecture offers engaging, stress-free stimulation. Residential suites are set amidst inviting open spaces with calming color schemes and quiet alcoves. And, each wing offers spacious family areas complete with fully-equipped kitchens and dining areas. At Hawthorn Court, every member of our professional staff understands the importance of personal respect and dignity. We work closely with loved ones and healthcare specialists, providing personal care assistance, activities, and reassuring surroundings to promote our residents’ comfort and security. .